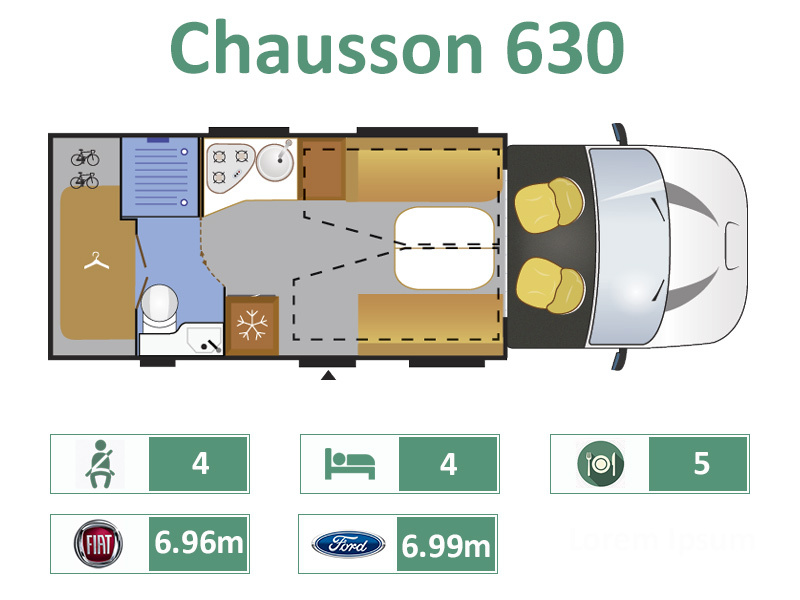 An instant success when first launched, the 630 provides the space and comfort normally found in much larger motorhomes, and at just 7 x metres in length the 630 can accommodate up to 4 x persons, with 2 x drop-down single beds that are situated long ways over the spacious `Smart-Lounge` beneath. The lounge that can be converted to a double bed when required and has a comfortable seat-belted `jump-seat` on both sides beneath the side cushions, which can be folded out when required. With well equipped kitchen and full width rear wash-room, wardrobe and large garage beneath, the 630 is well deserving of all the praise and awards it is receiving. Available in the Welcome or Welcome Premium specifications, and on the Fiat or Ford chassis with manual or automatic transmission.